Apple today issued a press release formally confirming that the iPad will launch this Saturday in the U.S. Wi-Fi iPad models will be available in all 221 U.S. Apple retail stores and at "most" Best Buy locations beginning at 9:00 AM. 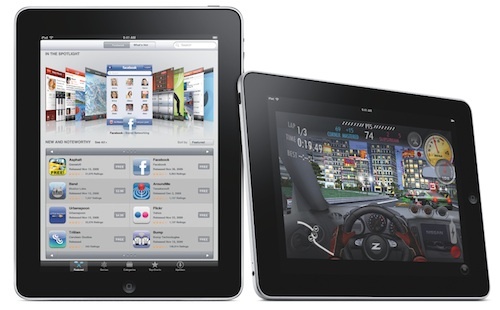 "iPad connects users with their apps and content in a far more intimate and fun way than ever before," said Steve Jobs, Apple's CEO. "We can't wait for users to get their hands and fingers on it this weekend." Apple also announced that all customers making iPad purchases in its retail stores will receive free Personal Setup service, which includes assistance from Apple staff with setting up email accounts on the device, loading applications, and other tasks. Apple retail stores are also set to begin hosting iPad workshops this Saturday, offering customers ways to get more out of their devices. Customers who pre-ordered Wi-Fi models have noted that their devices have begun shipping, although the orders are not expected to arrive until Saturday.